Elizabeth Ride has sent a 1942 map and several WW2 BAAG reports about WS Bailey & Co, more usually known as Bailey’s Shipyard. Elizabeth says, The Intelligence Summaries sent on nearly all the information brought to BAAG by their underground agents, but added their comments if they thought it sounded improbable. HF: Where the original report is difficult to read I have retyped it. Bailey’s Shipyard was founded in 1897 by WS Bailey. In 1900 Bailey was joined by EO Murphy and a shipyard in To Kwa Wan was established. 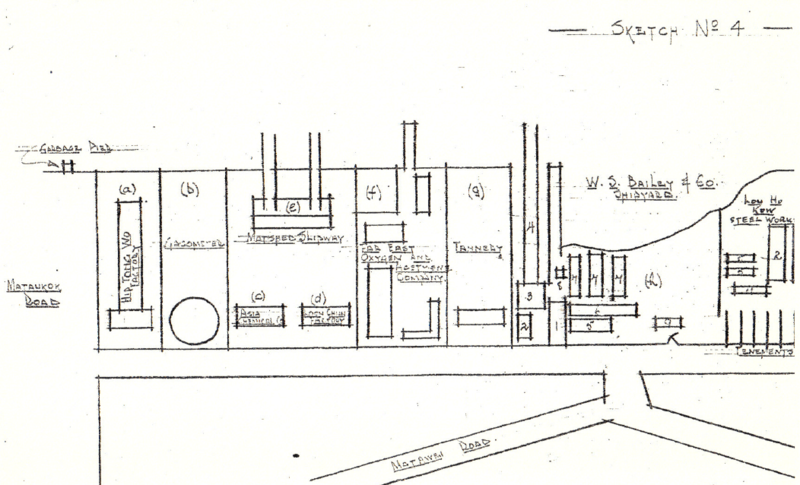 The BAAG sketch map below of the yard is from June 1942. It indicates the location of several companies and industrial sites as well as Bailey’s. Information about any of them would be welcome. Layout. [Map GSGS 3868, HK & NT 1/20,000. Ref: 22155750]. “In November 1942, Japanese trawlers and small craft were being repaired. In April 1944 the yard employed 740 workmen, but the number decreased in July to 400. However, after the raid of 16 October 1944 on the Kowloon Docks the number was reported to have increased again. About 4000 workers mainly employed in repairs of military craft. Pay received by workmen similar to that of Kowloon Docks. At present, Holt’s Wharf, Kowloon Wharves, Kowloon Docks and Bailey’s Shipyard are all under the control of Kokoki Butai. “Bailey’s Shipyard in Tokwawan was reported in April 1944 to be controlled by the Kowloon Docks, but in July was said to have been taken over by the Akatsuki 2941 Butai. Wooden vessels are built by this yard, which is also engaged in repairing small craft. In April 1944 the yard employed 740 workmen, but the number decreased to 400 in July. However, after the raid of 16th October 1944 on the Kowloon Docks, the number was reported to have increased again. 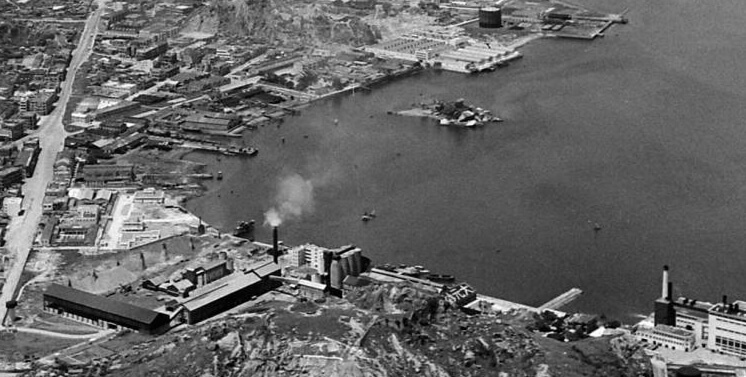 Since the suspension of the outside source of electricity, an auxiliary Ship’s engine has been used to generate power.”HF: This photo from 1949 shows a number of industrial concerns including CLP’s Hok Un power station bottom right, Green Island Cement with the smoking chimney, Bailey’s shipyard at the corner of the bay and Hongkong-China gasworks top right. This article was first posted on 26th June 2015.